A few weeks ago when we found out Boris Johnson was standing for mayor, we were looking forward to seeing what his transport policies were going to be. Well in true bumbling Boris style he's come up with a rather poetic look at Tube travel. Yesterday he was accused of not taking his application form very seriously and a labour MP said "he thinks the whole think is a jape and that causes heaps of laughter amongst old Etonians". But when you get asked questions like "In no more than 600 words state the most important challenges facing London and explain how you would approach them in your role as Mayor", you must be hard pressed to not take a schoolboy approach. 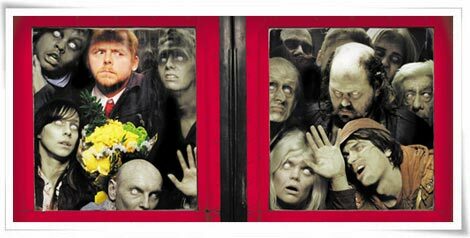 Transport is one of his big challenges though and he said "I see the hollow-eyed look of people emerging from the Tube after anothe (sic) miserable experience"
Wondered if he was thinking of the Sean of the Dead poster or the above old Munch inspired ad from 1992? So how will he deal with the challenges? By "recruiting the ablest people across London - of whatever political affiliation to formulate new policies for the core problems that effect our everyday lives". Although he seems to have got cut off in his prime or perhaps he'd reached his 600 word limit, as this page ends with "As Mayor of London it will be my job". Or perhaps he's so confident that he feels the job's in the bag! We shall see. 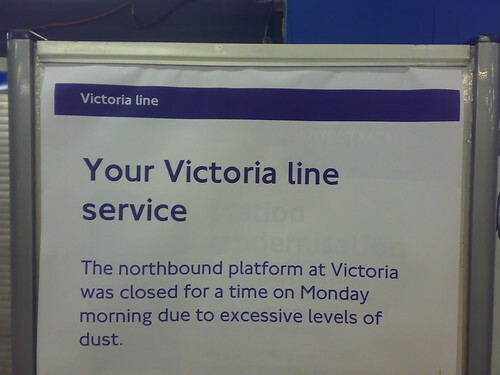 You might have some problems using the Piccadilly Line towards Heathrow from the middle of August. And it won't be anything to do with signal failures. The British Airport Authority are trying to go ahead with a massive injunction to stop people attending a Camp for Climate Action protest taking place at Heathrow Airport between August 14 to 21. They're seeking a ban on approaching the airport by 5 million people and this will include the Piccadilly Line, Heathrow Express & parts of the M25. See The Guardian, for more on this. Personally I don't see how this will be possible, as although they're aiming at the protesters including the National Trust, Woodland Trust, RSPB supporters, members of Greenpeace, Friends of the Earth and the Campaign to Protect Rural England - the injunction if carried out would effect anybody trying to get to the airport. According to Greenpeace "'a source' who's spoken to BAA has just told us that BAA is deliberately making the ban as broad as possible, and leaving it up to the police to apply it with common sense. Which means, if BAA wins, the police will have the right to stop you, me or Her Maj from, say, getting on "all railway trains and carriages operating upon the Piccadilly line". Sheriff Ken is none too happy about this and said "I regard BAA's proposed injunction as a serious infringement of civil liberties and an attack on the right to peaceful protest. 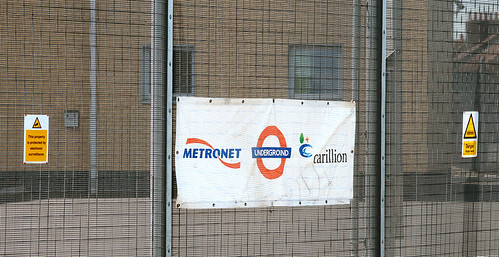 It could have a significant impact upon London Underground operations. BAA did not consult Transport for London about this proposed injunction. Transport for London will be writing to BAA to demand that all reference to its property and services be removed from any such injunction and will oppose any attempt to restrict the lawful use of its public transport services in the courts." In the meantime there's a party on the Piccadilly Line this Tuesday 31st July if you feel like a protest. If you have a Facebook account you can find out more about that here. It's just taken over two and a half hours to get home from Gatwick this evening (Gatwick Express is a misnomer, District Line to Richmond screwed with NO replacement buses), and I'm not best pleased with public transport, so it's nice to hear of a pleasant Tube story rather an one based on delays and today's strike action. Raj Dabasia the station control operator at Paddington proposed to his girlfriend Nimisha Siyani, over the public address system, while she waited on the Circle line platform for her train to work. He then went on to the platform in front of cheering passengers, got down on one knee and gave her a ring. He said "I had planned a proposal in a hot air balloon in June, but bad weather prevented that". Luckily, bad weather wasn't used as an excuse to stop the Tube today, and luckily he chose the morning otherwise his girlfriend would have been making an alternative route home as the Circle line was screwed this evening. By the way, she said yes. I will be in the sunny (I hope) South of France for the next week or so, so can happily say bollox to the Tube. Look out for the new sponsorship of buskers on the London Underground from Monday (the londonpaper & Capital FM: "We want to establish buskers as individuals and champion the role they play in making everyone’s journey more entertaining", they said). Apparently breakfast DJ Johnny Vaughan will be busking on Monday morning too, so please give him some foreign coins if you happen to be going past his spot. "I've lived in the UK long enough to know that this is the only country where "leaves on the track" stop our trains but this seemed a new level of silliness. Was the dust "high in fat or low in fat" I wonder?" Is Commuting gambling with the devil? So Boris Johnson is standing. If his thoughts on train travel are anything to go by, you could read the headline in thelondonpaper as standing for a train rather than standing for Mayor. After the 'is he? isn't he?' speculations last week Boris is putting himself up against Ken for the Sheriff's role. 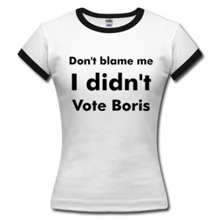 As outspoken as Ken, Boris once said "To rely on a train in Blair's Britain is to engage in a crapshoot with the devil." Will he be able to make it any different in Brown's Britain? If he does become Mayor, we might see an end to the "Mayor Tube Spots", as he'll probably stick to his bike. I saw him zooming down Shaftesbury Avenue on his bike one day and it had a similar shock value to seeing Ken on the Tube. I'm looking forward to hearing more of Boris' thoughts on public transport as his campaign begins in earnest. 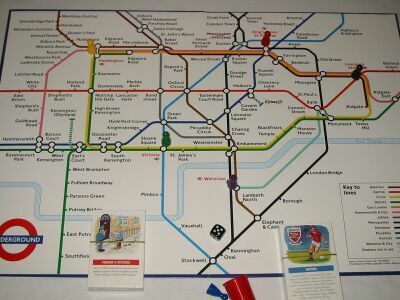 Perhaps we'll all get some dice with our Oystercards if he comes in power, or become experts in playing The London Game. Down the drain for Metronet? Thanks to the various people who sent emails about Metronet's woes - and almost to a person they said "try not to laugh too much". By the end of tonight or tomorow we'll find out if there as a last minute rescue attempt or whether the boys will be sent in to close Metronet down. One way or the other it appears as though it's not going to make a big difference to us as commuters - even though Metronet is responsible for maintaining the Bakerloo, Central, Victoria, District, Circle and Metropolitan lines. However, TfL rather than Metronet would probably be left to pick up the bill for any overspending on maintenance or renovation work. Currently it's estimated that there will be an overspend of as much as £2bn by 2010 - and ultimately whether it's TfL or Metronet we'll be feeling the effect on fare inceases. Obviously both organisations are blaming each other for the overspend - TfL as saying that Metronet are mismanaged and failed to control costs. 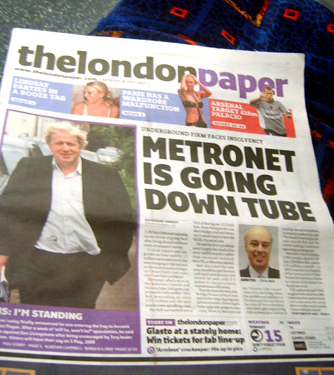 Metronet's response is that London Underground & TfL have changed the specifications outlined in the contracts and asked for higher quality work and more expensive upgrades. Metronet's website is tightlipped about the situation, so for the moment it's a case of keeping an eye on the news. 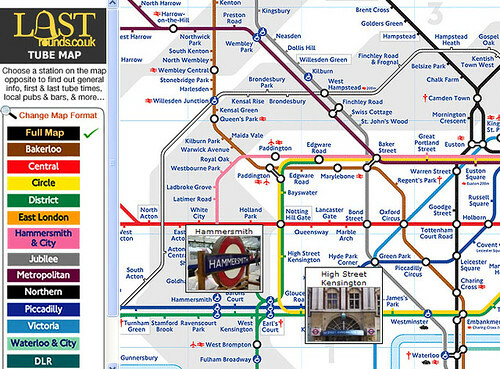 When I started www.goingunderground.net in the days way before this blog, one of the most common questions I was asked (and in fact still get asked) is "what time is the last Tube?" 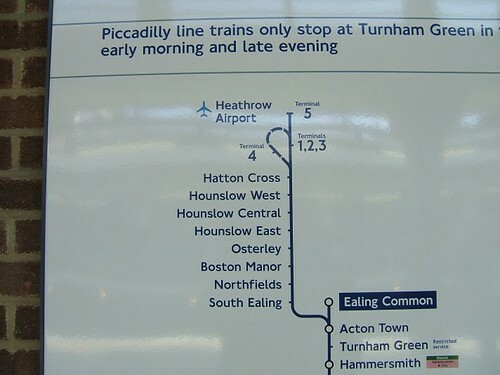 TfL used to do a fairly rubbish job of displaying last times o their site - it's better now but you still have to open up individual PDF's for each line. But now with the obsessiveness that I love about the internet, someone has painstakingly prepared a Tube Map that shows the first and last tube times for all the lines by station, and even visited Flickr and added a little picture of each station too. When the page has loaded roll over the map and you get a little image of each station plus information about local pubs and their walking (or staggering distance) from the Tube station with a handy links to Google / Street and Tube maps. You can also change the format of the map to the line of your choice by selecting an option on the left. The site - Lastrounds.co.uk is still fairly embryonic but it's perfect for planning a night out and is clearly a labour of love. Plus if you're ever caught short after chucking out time you can see where the nearest public loos are too. "Hi Annie. I was on the train that derailed at 40mph between Mile End and Bethnal Green yesterday morning - only one person had a sprained ankle to show for it on the whole train apparently and no one was scared although a bit shaken up (Dunkirk spirit and all that). It was quite exciting to walk up the tunnel back to Mile End - masses and masses of firemen and coppers hanging around waving torches... an interesting experience! "Anyways I have the feeling it will be a while until we see Central line services again - I was in about carriage 3 and all the way back through the train each carriage was leaning at a jaunty 20% angle or so against the tunnel wall - hate to think what damage has occured to the tracks. "Let me know if you want to know any more - don't believe what you read in the papers! (One thing I will say is that there was an off-duty train operator in our carriage who had been up to see the rather shaken driver. He said the driver thought he had seen a battery or similar lying on the rail which caused the train to jump off - I guess it must have dropped off the previous train)"
And he signs off "(a slightly sooty) Pete"
"At this stage it appears that one passenger has suffered a minor injury to their foot. LU is putting in place well-practised plans to safely remove passengers from the train, and from a stalled train behind it. Both stations have been closed". 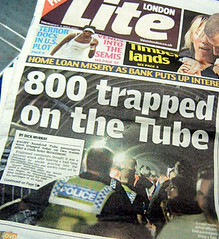 TfL announced that by about 11am 700 people were taken off the derailed train , and one stuck behind it (although by this evening this figure was apparently 800 according to London Lite). They were walked down the track to Mile End station. 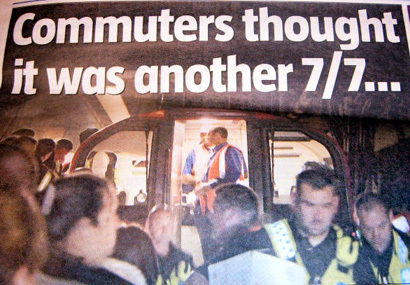 A number of the commuters thought it was a terrorist attack. One said "At first I thought it was a bomb because there was a loud bang and then smoke. The lady next to me started crying and said she lost a friend in 7/7. Some people started panicking and screaming. I was in the fourth carriage and people began running from the first carriage thinking there was going to be an explosion". However, emergency services ruled this out fairly quickly. Another passenger was also worried it was a terrorist attack "I just thought my time had come and my life flashed before me. Every time I am on the Tube, I worry about bombers". Interestingly we were discussing worrying (or not) about attacks on the Tube in light of the recent incidents, and I'm sure if you were on this train, there's no surprise you would be feeling like this. Luckily major casualties were avoided as the train stayed upright during the derailment. The first emergency workers who arrived said it was a miracle that no one was killed or badly injured. 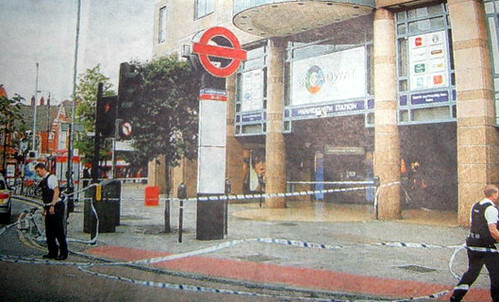 Both Barons Court and Hammersmith Tube stations were closed this morning after a suspect package was spotted outside Hammersmith Broadway shopping centre (which leads to the London Underground station). I normally change at Hammersmith and when leaving the house I didn't know that Barons Court had been closed too, but by the time I reached Hammersmith (about 9.30am) it had re-opened again. No one seemed remotely concerned and only a few people like myself nipped off the District Line at Ravenscourt Park as Piccadilly Line trains were temporarily stopping there. Going through Hammersmith it was business as usual. No extra announcements to look out for suspect parcels and suspicious behaviour, nothing. It's interesting that the London Paper chose to find a commuter from North London who must be travelling on a different Tube system to me and other commuters I've noticed. Mr Smith from Enfield said "I think the level of panic has gone up without a doubt. The public is worried and wary and looking out all the time. After 7/7, people were looking for suspicious men with bags, but now there's a new dimension which makes things scarier because more things can be a threat and the threat is very real." More people at work at talking about the rubbish weather at the moment and we work less than half a mile away from the failed bombing attempt at Tiger Tiger. A new colleague who sits opposite me at work, who's on secondment from the US, is amazed at how calm we're all being. Is it because, luckily, no innocent people have actually been injured? Or what is going on? Do we think we can travel more easily in London because areas like Glasgow are now targets too? I still think Mr Smith quoted above is wrong. After 7/7 there was real worry on the Tube and you definitely saw people shiftily looking at anybody with a rucksack (particularly if they looked a bit "foreign"). Today, I sat through a station that had just been closed due to a suspect package outside of it and hardly gave a second glance at the Asian guys (complete with rucksacks) who sat opposite me. Have you noticed any different behaviour on the Tube? Will the guy from the transparent Freedom bags think he's onto a little earner again? We are supposedly on critical terror alert after all. Thanks again to all of you eagle eyed guys and gals for keeping on the look out for the Tube roundel on your travels outside of London. Good to keep LU's lawyers on their toes. 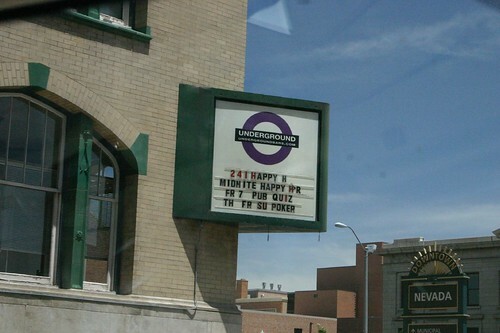 Firstly this bar "The Underground" was spotted by Ginny on a trip to Colorado. Ginny says "It was shot through the window of our rental SUV as we tried to make a left turn onto Nevada Street in Colorado Springs, CO. I happened to have the camera handy and of course the first thought I had was "Aha! A sighting of a NotTheUnderground sign! Now I can make up for completely missing the one right in my own area". A bit closer to home we have the roundel being used to advertise a scouting event at Brownsea Island in Dorset. Thanks to Chris "Awkward" McKenna for sending this my way. Not sure TfL's lawyers will get great publicity from going after some clean living campers, but you never know. He said "Living in the southern part of Holland I travel in Belgium quite a bit and have been regularly passing this sign in a small village near Antwerp. Normally it's difficult to stop there, but this time I spotted a parking place not far from the sign - and I had my camera with me - so here you go. 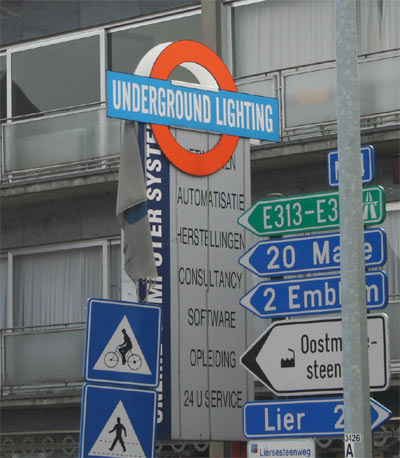 Underground Lighting shop sells lights and lamps - the funny part is that the underground sign is stuck on top of some computer firm's sign!". Cheeky monkeys. Many thanks to Ginny, Leo and Chris. I also received an almost roundel from a Toronto restaurant, but they hadn't quite gone the whole hog with a complete rip off, probably to err on the side of legality or avoid paying a licensing fee. Please keep your photos of the roundel coming in and I'll add them to the Flickr set.